Two people were killed, and two others critically injured after gunman randomly opened fire on two motorists and a Metro bus and later caused a collision as he tried to flee in a stolen car. Authorities said one man was fatally shot and another killed in an automobile crash. 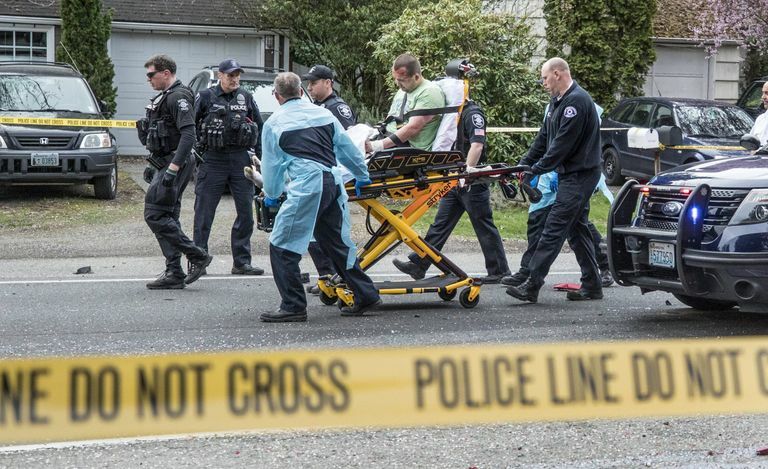 The shocking incident unfolded in a north-eastern Seattle neighborhood when the 33-year-old suspect approached a motorist at an intersection and shot her before walking into the street and opened fire at an oncoming King County Metro Bus. The bus driver was injured but managed to turn the bus around and head away from the assailant. However, none of the 12 passengers onboard were harmed. According to bystanders, the male suspect who lives in the area, emerged from his home with a gun and randomly open fire. Marc Garth Green, deputy police chief, informed the media that authority believes, “this is a one lone suspect involved in this random, senseless act”. Law enforcement personnel outraged at what this suspect did. However, Seattle police is investigating the case and trying to identify the possible motive behind the act. A 50-year-old man was shot and killed at the scene and a 70-year-old male died in a collision with the high-speed suspect’s car. The two other victims, a 57-year-old woman, and a man, whose age is not yet known, were taken to the Hospital where they remain in a critical condition. The Seattle Division of the Federal Bureau of Alcohol, Tobacco, Firearms and Explosives is assisting Seattle police in their investigation, as is the King County Sheriff’s Office and Metro Transit Police. Seattle has one of the highest crime rates in America compared to all communities of all sizes. One’s chance of becoming a victim of violent crime in Seattle is highly probable. Experts mostly connect these crimes with the uprising gun violence. Seattle Mayor Jenny Durkan said precisely that it’s chance to uproot senseless gun violence. Hundreds of innocent Americans are slaughtered with guns every day while we still dispute about reforming the nation’s gun law. The effects of gun violence on the communities and youth is frightening as it is to live in eternal fear you or your family member could be the next victim. When people think of gun violence, they usually think of large-scale mass shooting like Pittsburgh Synagogue massacre or the most recent- the mass shooting in Christchurch, New Zealand. Gun violence is a leading cause of premature death in the US and around the globe. However, government or law enforcement personnel haven’t identified the root or cure of this plague. According to the reports, more than 33,000-gun violence deaths take place each year and only a small percent come from a mass shooting. Gun Violence Archive states that the total number of gun violence incidents this year is more than twelve thousand and the number of innocent victims died in the crossfire is approximately three thousand. It is alarming that more people have died from gun violence than terror attacks. We all want to be safe and secure, and to live without fear, and that’s a human right we individual have. However, uprising cases of gun violence directly threaten these rights. So, what choices do law enforcement personnel or government have? The important question for readers is whether the law enforcement should wait for another gun violence or mass-shooting and arrest merely foot soldiers or crack this case open to identify the root of this problem. and bad-apples in the society. Repeatedly, we are heartbroken by the news of another mass shooting. It is like a whirling- another shooting, another set of grieving families. Most people including the readers would acknowledge that something must be done. Is there anything that works to reduce violent crime including gun deaths in a country in which civilian gun ownership is a fundamental right? When such a question emerges only one technology in the security market have means to provide a guaranteed solution. Developed in close conjunction and at the guidance of experts in the field of counter-terrorism, counter-intelligence, national security experts from the US, iCognative is one-of-a-kind technology that understands the challenge encountered by law enforcement personnel on a periodic basis and strives to make their lives easier. Today, lawbreakers are smarter and more adaptive to a situation, they can easily manipulate legal loopholes. No matter how stringent are the laws the criminals know how to work around them. iCognative is a truly disruptive technology introduced by Brainwave Science which plays a vital role in the identification of perpetrators before and after a mass shooting and further reveals what specific crime-related information perpetrator/s or suspect/s possesses, necessary for law enforcement personnel to identify the handler, seized illicit guns and stop future gun violence. iCognative enables the law enforcement personnel to determine who is the criminal or a domestic terrorist and who is the innocent with virtually 100% accuracy. Further, this revolutionary technology reveals what information suspect’s brain possesses and/or trying to conceal from the investigator. All these results provided by iCognative are perfectly accurate without any slightest hope of error or human intervention. The United States law enforcement agencies including Seattle Police should utilize iCognative technology in such complex cases where determining the specific motive and accomplice is mandatory to stop future gun violence attacks. In this case, all the necessary crime-related information could be accessible and verified with almost perfect accuracy once a 45-minutes iCognative test is conducted by law enforcement personnel on an arrested suspect. Information such: involvement of an accomplice, how he obtained the gun, motive behind the attack, connections to known or unknown terrorists, connection with any previous gun violence in the United States, identification of handler if any, details of future attacks, etc., would be easily available to law enforcement agencies to investigate this case and identify the perpetrators before they commit a crime. iCognative is the only technology that could help law enforcement agencies to uproot this problem in no time and protect millions of lives. A case officer or an investigation team member uploads all the investigative details of this and previous gun violence case into the iCognative system protocol. The system records and analyzes the brain responses when case related, and confidential information is flashed to the suspects on a digital screen in the form of pictures, phrases or words and determine with over 99% accuracy what information he possesses and/or trying to conceal from the investigation. iCognative assures that no perpetrator can cheat or hide any crime-related information or remained unpunished for his crime. Brainwave Science’s iCognative is the only technology that can guarantee a positive outcome of this complex case and provide accurate intelligence to eliminate gun violence problem, irrespective of the ongoing debates in the US Senate. No other security solution can meet the superior performance, ease of implementation, and cost-effectiveness of iCognative.